There is a widely held belief that Thomas Cook invented the railway excursion. In fact the railway excursion is almost as old as the railway itself, dating back to the 1830s, when hordes of people from one town would descend on another for a 'cheap trip'. Susan Major has carried out much in-depth research for this book, drawing on contemporary Victorian newspapers, and discovered that in fact Cook played a very minor role, mainly in encouraging middle-class people to go on more expensive excursions. Her book fills an important gap in railway history. 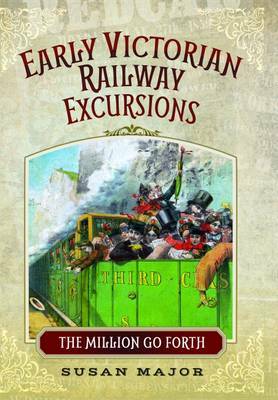 It explores for the first time how the vast majority of ordinary working people in Britain in the middle of the nineteenth century were able to travel cheaply for leisure over long distances, in huge crowds, and return home. This was a stunning experience for the excursionists and caused great shocks to observers at the time. These 'trippers' had to overcome many obstacles, particularly from the Church of England and the non-conformist movement, who were affronted by the idea of people enjoying themselves on a Sunday, their only day away from work.The book takes the story of the early railway excursions from the 1840s to the 1860s, a dramatic period of railway and social change in British history. It looks at how these excursions were shaped and the experiences of working class travellers during this period, demolishing a number of cliches and myths endlessly reproduced in traditional railway histories. While Michael Portillo paints a picture of travellers sitting tidily in their railway carriages, consulting their Bradshaws, many working class excursionists on their trips were hanging on to the roof of a crowded carriage, endangering their lives, or enduring hours of travel in an open wagon in heavy rain.